“What do you have to lose?” was the question then-candidate Trump regularly posed to minority voters. Speaking directly to Hispanic and African American voters who tend to lean Democratic, his argument was simple: Democrats had not succeeded in advancing your economic prospects — so why not give Republicans a shot? Fast-forward two years. Now president, Trump claims he has been successful. As evidence, he points to the “lowest [poverty] rate ever,” an “all-time high” median income and booming homeownership rates for Hispanics and African Americans. 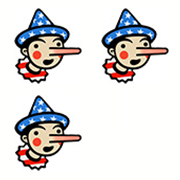 Regular readers of The Fact Checker know we tend to award Two Pinocchios to anyone who gives sole credit to a president for the state of the economy. That’s because the U.S. economy is complex, and the decisions of companies and consumers often loom larger than the acts of government officials. The economy is doing well, and, as we’ve previously reported, many of the positive trends started before Trump took office. But Trump’s claim here is more specific. Have his policies had an outsize impact for African American and Hispanic communities compared with the country overall? Let’s dig in. President Trump claimed the poverty rate for African Americans has “reached its lowest rate ever,” and for Hispanics, it “has reached an all-time low.” At first look, Trump’s statements are correct, according to data from the U.S. Census Bureau. The official poverty rate for African Americans fell to 21.2 percent in 2017. For Hispanics, it dropped to 18.3 percent. The overall SPM is declining at a slower rate than the official poverty rate, dropping only 2.2 points since its peak. For African Americans, its lowest point was in 2016 with a slight uptick in 2017. Hispanic Americans, however, did see the lowest rate ever in 2017. Despite the data, experts are hesitant to credit the president with success. Gregory Acs, vice president for income and benefits policy at the Urban Institute, said the economy is still largely a “reflection of the policy environment that was in place for the last several years” before Trump took office. Plus, he noted that the effects of the Trump tax cut, the president’s signature economic achievement, were not reflected in 2017 data. Homeownership rates have declined across the board since the recession. But the housing crisis hit the African American community particularly hard. In 2004, almost half of African Americans owned homes. In 2017, African American homeownership dropped 6.6 percentage points. Jonathan Spader, a senior research associate at Harvard University’s Joint Center for Housing Studies, said part of the steep decline was due to the type of loans African American households had used to finance their homes. Hispanic households also saw a decline. A decade ago, in 2007, 49.7 percent of Hispanics owned homes. In 2017, 46.2 percent of Hispanics owned homes. Homeownership rates for both demographics have started to recover in recent years — 2015 for Hispanics and 2016 for African Americans. The market started to stabilize, Spader explained, and once the foreclosure backlog cleared, the overall economy improved, and real wages started to increase again. And so, the recent uptick in homeownership, he says, has more to do with overall trends than any new federal housing policy. Although growth has been sluggish over the past several decades, generally speaking, incomes have been rising. Median income for Hispanics has reached an all-time high. But African American median income, which was $40,258 in 2017, still lags more than $2,100 behind its level in 2000. Plus, after gains over $1,000 in 2015 and 2016, median income for African Americans fell in 2017. The president cited six statistics: median income, homeownership rates and poverty rate for both African Americans and Hispanics. In each case, he claimed there had been marked improvement since he took office. Only three of those statistics were numerically accurate. And in each of those cases — Hispanic American median income and the poverty rate for both African Americans and Hispanic Americans — the underlying economic trends started well before Trump took office. Plus, experts say his tax cut had yet to filter into available data. The president is often eager to prove his economic might. But he should be more careful when promoting success. He earns Three Pinocchios. Can't see the Poll?Click Here.